The Blackphone is something that had debuted back in February as an anti-surveillance device in the wake of the severe NSA threats which had emerged around that time. This device has been priced at $629 and it comes equipped with an Android-based operating system which kicks in an array of security traits. 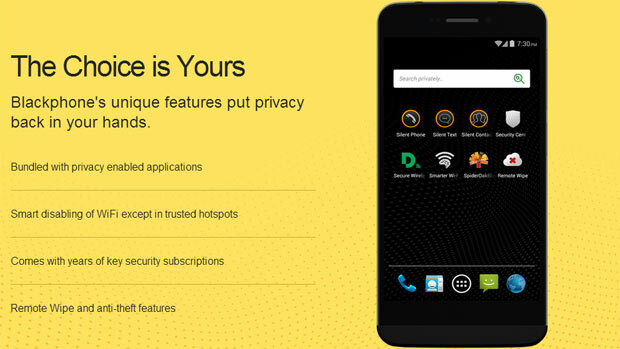 The Blackphone has been developed by Silent Circle and Geeksphone as part of a partnership. It makes use of government and enterprise-grade encryption techniques and provides a range of core applications that offer commercial security tools to make sure that your digital footprints are not accessed by anyone else but you. On its front, the BlackPhone features a 4.7-inch 1280 x 720 pixel HD display, while its rear surface is highlighted by an 8MP camera with LED flash. An Nvidia Tegra 4i chipset featuring a 2GHz quad core processor finds its way inside it, apart from 1GB of RAM. This device also features a 2000mAh battery. Sized at 141mm x 69mm x 9mm, if offers 16GB of storage and a microSD card slot for further expansions. A 5MP front camera and sensors for gravity, light, proximity and GPS have also been granted to the smartphone by its makers. The Blackphone is currently being shipped to early buyers, but its general sale is set to begin on July 14.